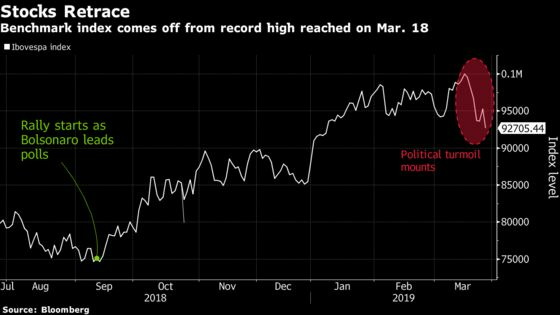 (Bloomberg) -- Many foreign investors could be excused for feeling ever so slightly smug about the slump in Brazilian assets this week after sitting out the rally that started in the second half of last year on skepticism over the outlook for reforms. The benchmark Ibovespa stock index fell to the lowest since Jan. 8 on Wednesday, while the real slumped for a second day, hitting a five-month low. 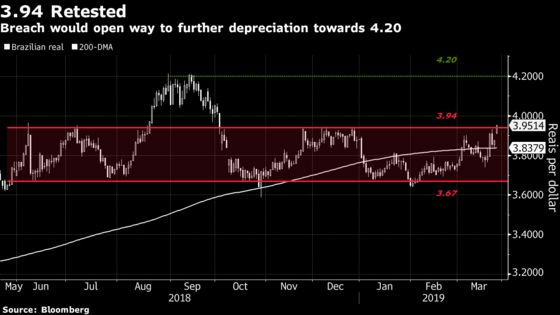 Brazilian assets are suffering as increased friction between President Jair Bolsonaro and some of his key allies in Congress threaten to slow or even derail the pension overhaul seen as critical to controlling the fiscal deficit. While foreign investors had long warned of continued political risk in Brazil, local investors had fueled a surge in stocks and bonds that began in mid-2018 on optimism Bolsonaro would garner sufficient support for the bill. Bolsonaro’s public support has plummeted, he’s antagonizing key allies and his cabinet is riven by intrigue and infighting. Foreigners pulled the equivalent of $662 million from Brazilian stocks in February as a rally stalled, extending a 2018 exodus that marked the biggest annual outflow since the global financial crisis. Then they added $1 billion through March 22 as the Ibovespa climbed above 100,000 for the first time last week. The 4.3 percent slide in the currency and 5.5 percent drop in the Ibovespa over the past week shows traders are now pricing in a lengthier process of approval and a watered down final reform. However, prices aren’t reflecting a complete defeat for the government in its flagship policy. Marcin Lipka, a senior analyst at Cinkciarzpl in Poland who was the most accurate forecaster for Latin American currencies in fourth quarter of last year, according to Bloomberg rankings, says that if politics don’t stabilize the Brazilian real could easily weaken to 4 per dollar, a level last seen in October. The latest setback suffered by Bolsonaro was the lower house’s quick approval of a bill that undercuts the government’s budget control. The constitutional amendment could restrict the ability of the administration to freeze spending, a rebuke to the president as he tries to trim the fiscal deficit. “If we don’t see soothing words from the government in the coming weeks, the correction might get worse,” said Delphine Arrighi a London-based money manager at Merian Global Investors. For now though, markets are still pricing an approval of the pension reform, albeit with lots of noise and some dilution. “Bolsonaro has dented, but not yet broken, credibility with investors,” said Jim Barrineau, the New York-based head of emerging-market debt at Schroders.